DISCOVER THE ORIGINS OF THE FIRE EMBLEM SAGA! • Assemble an army and use your strategy to outsmart and outfight the forces of darkness. Position your archer to rain arrows on your foes, or charge full-speed into the enemy flank with a Cavalier! • The all-new prologue introduces you to the art of war and sets the stage for Prince Marth's battle to free his stolen homeland. 01-21-2016 silverbow Box Text SHADOWS ARE GATHERING DISCOVER THE ORIGINS OF THE FIRE EMBLEM SAGA! • Assemble an army and use your strategy to outsmart and outfight the forces of darkness. Position your archer to rain arrows on your foes, or charge full-speed into the enemy flank with a Cavalier! • The all-new prologue introduces you to the art of war and sets the stage for Prince Marth's battle to free his stolen homeland. 07-24-2014 kwisatzhaderach Description *Assemble an army and use your strategy to outsmart and outfight the forces of darkness. Position your archer to rain arrows on your foes, or charge full-speed into the enemy flank with a Cavalier! *The all-new prologue introduces you to the art of war and sets the stage for Prince Marth's battle to free his stolen homeland. 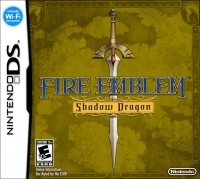 07-24-2014 kwisatzhaderach Box Text SHADOWS ARE GATHERING DISCOVER THE ORIGINS OF THE FIRE EMBLEM SAGA! 05-13-2012 disgaeniac Description *Assemble an army and use your strategy to outsmart and outfight the forces of darkness. Position your archer to rain arrows on your foes, or charge full-speed into the enemy flank with a Cavalier! *The all-new prologue introduces you to the art of war and sets the stage for Prince Marth's battle to free his stolen homeland. 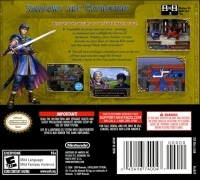 05-13-2012 disgaeniac Box Text SHADOWS ARE GATHERING DISCOVER THE ORIGINS OF THE FIRE EMBLEM SAGA! 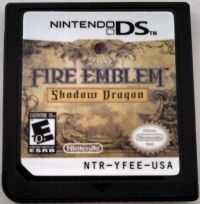 This is a list of VGCollect users who have Fire Emblem: Shadow Dragon in their Collection. This is a list of VGCollect users who have Fire Emblem: Shadow Dragon in their Sell List. This is a list of VGCollect users who have Fire Emblem: Shadow Dragon in their Wish List.